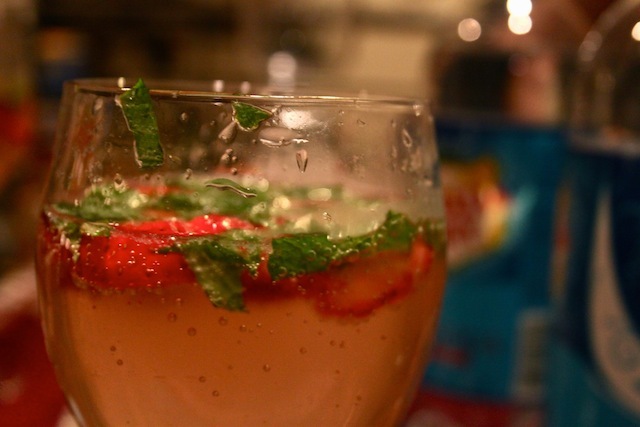 Summer in the City: Strawberry Rhubarb Pie – Eat Me. Drink Me. And much the same my summer days go by. I go to work, I come home, I cook a little, sit in the sun a little, try to do yoga when I can, try to stay hydrated so I don’t die. Yesterday for dinner, Anette and I assembled another of our fabulous conspirator meals. As she tossed together a Greek-style salad: lettuce, arugula, tomato, cucumber, feta, red onion, and olive tapenade with dressing as simple as olive oil, lemon, salt, and pepper, I grated sweet potato and mixed it with egg, breadcrumbs, chopped onion, rosemary, thyme, and oregano. I added a few teaspoons of semolina to make my mixture stick together, then formed little patties and fried them. We sat outside and declared it a perfect summer dinner. 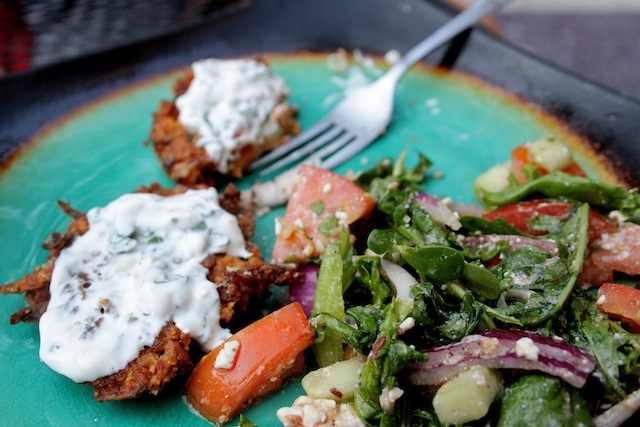 Greek salad and sweet potato fritters dunked in a sauce of sour cream, mint, and garlic. All winter I said, “Oh how I wish it was warm. I promise not to complain once this summer if only the weather gets warm.” And I haven’t complained. Just said, very declaratively, “It’s hoooooot.” And I won’t complain. So summer, summer, bring it on. I’ve chosen my weapons. 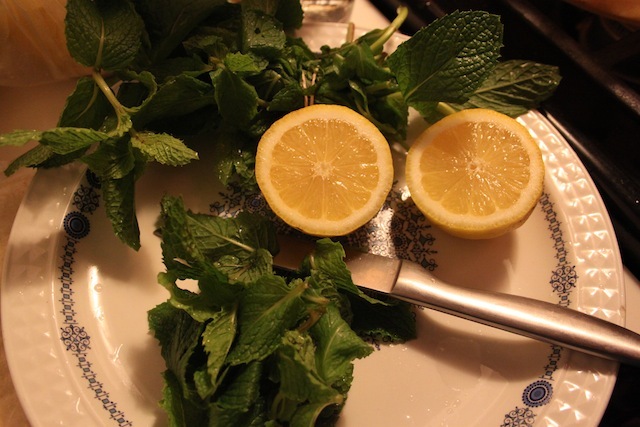 They are: lemons, yogurt, mint. Mix flour, vegetable oil, milk, and salt together in a large bowl and roll into a smooth ball. Add more flour if the mixture feels too wet. Detailed pie crust instructions can be found here. Press dough into a pie dish. Wash and cut rhubarb into 1 inch chunks, and quarter strawberries. To the fruit, add: sugar, vanilla, flour, and lemon juice. Toss well to coat. Pour into pie dish and bake in a 375° oven for 1 hour or until crust is browned and fruit is soft. Serve with vanilla ice cream. I like to add vanilla, a little bit of nutmeg, and some chopped crystalized ginger to strawberry-rhubarb pie; try it next time instead of lemon juice. Dear Lyz, Delightful reminiscing about lazy summers in the sun. I have so many good memories of firefly fields around your home and gauze canopies in the gentle night air, fire pits or outdoor movies… music and friends all coming together around a lovely table of confections and fruit or beer and homemade breads. Sounds like you continue the tradition. Love to you and yours! That pie looks delicious! 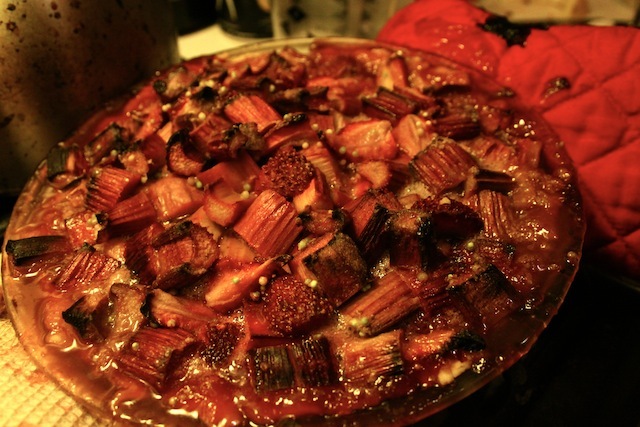 I really miss rhubarb….